We look forward to meeting you at the following IoT events! The IoT Tech Expo Global is the World leading Internet of Things event which will introduce and explore the latest innovations across the entire IoT ecosystem, covering Manufacturing, Transport, Health, Logistics, Government, Energy, Automotive, Insurance and more. The IoT Tech Expo 2018 will arrive in London on the 18-19th April to host 8,000 attendees including IT decision makers, developers & makers, OEM’s, government and council officials, automotive exec’s, operators, technology providers, investors, venture capitalists and many more. The IoT Tech Expo will showcase the most cutting-edge technologies from more than 300 exhibitors and provide insight from over 300 speakers sharing their unparalleled industry knowledge and real-life experiences. This year’s events are also co-located with the Blockchain Expo and AI Expo so you can explore 3 areas in 1 place. Executive Forum is pleased to host the third edition of IoT Madrid Forum. This international meeting will be held on April 25th 2018, at Cine Capitol (Gran Via, 41. 28013. Madrid). For more information, please visit the IoT Madrid Forum. The IoT Tech Expo Europe is Europe’s leading Internet of Things event which will introduce and explore the latest innovations across the entire IoT ecosystem, covering Manufacturing, Transport, Health, Logistics, Government, Energy, Automotive, Insurance and more. The IoT Tech Expo Europe 2018 will arrive in Amsterdam on the 27-28 June to host 8,000 attendees including IT decision makers, developers &amp; makers, OEM’s, government and council officials, automotive exec’s, operators, technology providers, investors, venture capitalists and many more. The IoT Tech Expo will showcase the most cutting-edge technologies from more than 300 exhibitors and provide insight from over 300 speakers sharing their unparalleled industry knowledge and real-life experiences. This year’s event is also co-located with the Blockchain Expo and AI Expo so you can explore 3 areas in 1 place. In 2018 and beyond, CTIA Super Mobility Week will become GSMA Mobile World Congress Americas, in partnership with CTIA. MWC Americas will debut September 12-14, 2018 in Los Angeles and will be the premier mobile industry event for the Americas, with representation from North, Central and South America. Mobile World Congress Americas will consist of a conference program featuring C-level speakers and leading industry experts, the industry’s biggest names, with a focus on complementing mobile operators with broad communications ecosystem leaders. The Mobile World Congress Americas will also feature an exhibition showcasing cutting-edge mobile technologies, products and services that will showcase industry-leading exhibitors with a strong focus on Silicon Valley, innovation, gaming and virtual reality. With a regulatory and public policy program, partner events and free seminar, MWC Americas 2018 will build on the successful CTIA policy education sessions and the GSMA ministerial programs to drive global policy discussion and debate. provide from over 300 speakers sharing their unparalleled industry knowledge and real-life experiences. Business benefits and return on investment are now a reality in the IIoT space. 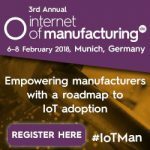 With this in mind, we are excited to bring you the 3rd annual, industry leading Internet of Manufacturing Germany Conference and Exhibition demonstrating how IoT technologies are boosting productivity and profitability across the sector. This year's conference is supported by the Diplomatic Council and aims to empower attendees with a roadmap to successful IoT adoption covering crucial topics from Security, Implementation Solutions, Training and Organisational Needs, Creating Agile Business Models and Smart Manufacturing.